Placing a 5 percent annual limit on how much the assessed value of properties can rise would shield owners from the kinds of spikes seen during the real estate bubble of the last decade, supporters of Proposition 117 say. Kevin McCarthy, president of the Arizona Tax Research Association, which is leading the campaign for the measure, said many homeowners suffered as property values surged but property tax rates didn’t necessarily adjust. “It’s going to slow down the surges in property tax revenue that are associated with the market swings,” said McCarthy, whose group advocates for government efficiency. However, Lea Marquez-Peterson, president and CEO of the Tucson Hispanic Chamber of Commerce, said Proposition 117 could interfere with Tucson’s ability to provide core services. Lynne Weaver, a Phoenix resident leading an effort to limit property taxes much like California’s Proposition 13, said Proposition 117 wouldn’t do anything to prevent taxing districts from raising tax rates. “Prop. 117 does nothing but add more distortion to the system, and it does nothing to limit your property tax bill,” Weaver said. Weaver’s plan, which she hopes to get on the 2014 ballot, would roll back property values to what they were in 2003, cap the tax rate at 0.5 percent on residential property and 1 percent for all other real property. It would limit valuation increases to 2 percent a year. Supporters of Proposition 117 argue that it would simplify Arizona’s property tax valuation system, one of the most complicated in the nation. Since 1980, property owners have been assessed on two taxable values: the full cash value – or market value – and limited property value – or secondary value. Full cash value is used to compute secondary taxes ranging from bonds to special districts for services such as fire and flood control. Limited property value is used to compute taxes for maintenance and operation of school districts, cities and counties. The limited property value can grow by 10 percent each year and, during a real estate boom, every three years by 25 percent of the difference between the two values. The problem, McCarthy said, is that the full cash value has no limitation on how much values can grow each year. McCarthy said Proposition 117 would simplify the system by creating a single valuation that would increase by no more than 5 percent annually. “It’s going to provide a level of certainty that currently doesn’t exist,” he said. McCarthy said the change would help local governments as well. “They also will have a better idea of what they can expect from the property tax system and what the growth trend will be for capital improvement plans that they will put together to sell general obligation bonds that are paid off with the property taxes,” he said. Yuma County Assessor Joe Wehrle, who supports Proposition 117, said that while the measure doesn’t limit the ability of taxing authorities to raise levies it would make property tax bills more predictable. A group called Yes on 117 registered with the Arizona Secretary of State’s Office received $54,500 in contributions, including $27,000 from the National Association of Industrial and Office Properties Arizona Chapter and $20,000 from the Arizona Tax Research Association. A group called Truth & Concerns on Prop. 117 registered with the Secretary of State’s Office but had filed no financial reports. Edward Perkins, a policy analyst for Arizona State University’s Morrison Institute for Public Policy, said the crux of the Proposition 117 debate is whether or not it would lower property taxes. He said he wasn’t so sure it would because taxing districts could still raise tax rates. “If people did their homework on this, this probably won’t change things a great deal in terms of property tax bills, but they may perceive it to,” Perkins said. 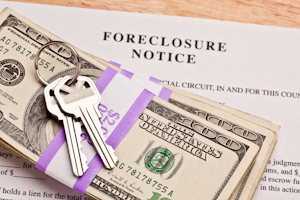 Not requiring mortgage lenders to take foreclosure cases to court is helping Arizona recover from the housing crisis faster than states that do, according to an Arizona State University researcher.